How about Electric Rodent Traps? Once rodents have gotten established in your home, or should we say, once rodents have made your home their home, it can be very difficult to get rid of them. They can make a big mess of an attic or a crawl space resulting in thousands of dollars in clean-up costs. It is not unusual for all of the insulation in an attic or crawl space to need to be replaced after an infestation. 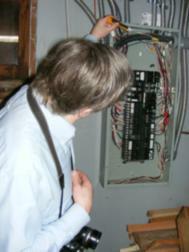 Sometimes they do damage to the wiring and that too must be repaired or replaced. At a recent inspection there were a dozen or so obvious places where wiring had been badly damaged and one can only assume that other damaged areas will be found when the insulation is removed. There were many traps present and I am not sure whether the infestation was active or not. Regardless, repairs to the wiring and cleaning the space will be necessary. One unusual thing was noted however, even this new fangled “electrified trap” clearly did not work!